5 Incredible Ways to Use Shipping Container for Food Services! Why using Insulated Shipping Containers for Food is a Brilliant Idea! Repurposed shipping containers have taken the world by storm in the last few years! More and more people are going for this low-cost alternative to traditional brick-and-mortar buildings for their retail businesses, especially in the food and beverage sector. Food and Beverage Container Shops Galore! Several pop-up restaurants owe their existence to these sturdy, durable placeholders that can be customised to suit the individual needs of the business in several winning ways. Here are a five really cool ideas for setting up a food and beverage shop out of shipping containers! Shipping containers are just so perfect for a juice bar (or a smoothie bar or a milkshake bar, if you please) in them. Given the very little space required for setting up a beverage service, the use of shipping containers becomes a very natural choice for establishing bars. Most of these bars can get by with just a mini-refrigerator or cooler set up – no need for any sophisticated kitchen appliances. Just add a blender or two and fresh ingredients, they are all set to go in no time! Shipping containers make great concession stands at outdoor events and other public places! No cooking or preparing takes place onsite for this kind of food service.These shops primarily act as points of sale for pre-cooked and/or pre-packaged foods. If required, they can even accommodate a cotton candy maker or a popcorn machine inside the premises. This is basically a warming service for pre-cooked food. The prepping and most of the cooking is typically done at a different location and the food is only put together and served at the food and beverage shop. We can clearly see a case for the use of a shipping container in this scenario. Again there is no need for a full kitchen set up – just a couple of basic workstations, a beverage dispenser perhaps, along with a cooler or mini-refrigerator and you are all set to open shop. Not satisfied with doing anything in half-measures and want to set up a full blown restaurant with all the bells and whistles? Insulated shipping containers for food services can definitely help with that too! You can either go for a stacked architecture to make room for a full service. Or use a shipping container for the kitchen only and build the rest of the premises around it. It totally depends on your vision and your budget. But whatever may be the case, using shipping containers would any day give you a cost benefit over the more traditional route. If you looking to showcase your kitchen, either as an attraction or as a teaching opportunity, then shipping containers make a solid supporting cast! Very often, these “teaching” kitchens are the highlight of the food experience. So they are bound to be all about chrome and industrial strength lights. In these scenarios, the shipping containers tend to be more in the background, to house generator units and water tanks and whatnot to sustain the kitchen. They make it relatively easy for the entire set up to be packed up and moved to a new location. Set Up Shop in a Food and Beverage Container in UAE! 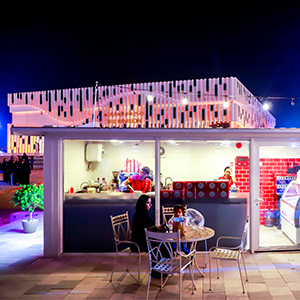 As you can see, there are some really clever ways to use shipping containers for setting up a food and beverage joint! So first, find the best shipping container manufacturers in UAE! Let your imagination (and your budget, of course) be the limit for what you can achieve with the humble shipping container. So, get those food dreams and plans underway! Set up a container shop today! 6 Factors To Consider For Your Shipping Container Home. 5 Reasons Why You Should Go For A Shipping Container Office!